Robert, thanks fer sharin'; that was really cool! Makes me wonder if the brothers, Auguste and Louis Lumière, or Georges Méliès did anything like that? Ernest H. Brooks II (Ernie) is one of the legends of underwater photography. The son of Ernest H. Brooks, who was the founder of Brooks Institute of Photography, Ernie grew up in Santa Barbara with the ocean as his playground. Long recognized as one of the premiere underwater photographers in the world, Brooks' specialty is distinctive black and white images that are timeless in their appeal. His coffee table book, Silver Seas, features an amazing collection of his photographs. To honor Ernie's contributions to the science and art of underwater photography, the Santa Barbara Underwater Film Festival will be presenting a Tribute to Ernie Brooks at the beautiful Arlington Theater in Santa Barbara on Saturday, September 14, 2013 at 7:00 PM. The program will be a benefit to raise funds for the Historical Diving Society USA and the Santa Barbara Maritime Museum. * Chuck Davis, Louis Prezelin, Ralph Clevenger, Richard Salas, Tim Anguelo -- The Crew of the "Just Love"
Wyland, Dan Orr, Bret Gilliam, and Doug Cummings, as well as a few surprise guests will provide special introductions for the evening. The master of ceremonies for the evening will be Leslie Leaney of the Historical Diving Society USA. Tickets for the VIP Reception with Film Festival Reserved Seating are $150.00 (plus ticketing fees) and are in short supply. General admission tickets with open seating are $38.00, plus ticketing fees. To order tickets, call the Arlington Ticket Agency at (805) 963-4408. Tickets can also be ordered through Ticketmaster. Both the Historical Diving Society USA and the Santa Barbara Maritime Museum are public 501(c) 3 charities and work together to preserve diving history. For more information on the Historical Diving Society USA visit www.hds.org. To learn about the Santa Barbara Maritime Museum visit their facility in Santa Barbara or go to www.sbmm.org. Hi Octopus. Thanks for posting this. 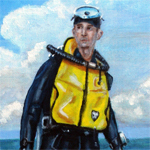 The Historical Diving Society did a similar tribute to Hans Hass in 1998. They filled a 2000 seat theater to capacity. The next day, people were lined up at a beach front hotel for a couple of hours to get books signed by Hans and Lotte. It was a great weekend. This one should be about the same. An Englishman name William Thompson is credited with taking the first underwater photos, in 1856. he was an amateur naturalist, but not a diver. He triggered his camera from the surface using a string to the shutter. A friend talked him into writing a report, which is the only way we know of his effort, but he did not pursue it beyond his first attempt. Journalist, author and film director, Pippo Cappellano specialises in the study of underwater life, and documentaries on marine biology. He is a member of A.D.S.E.T.S. - (Academy of Science and Underwater Techniques) of Ustica, (Sicily) and of the Accademia Tiberina of Rome, Golden Trident Award in 1983. Author of numerous publications, among which "Una vela nel mare del mistero" (A sail in the sea of mystery), "C’era una volta il mare” (Once upon a time… the sea) and "Il Cameraman subacqueo” (The underwater cameraman), Pippo also teaches underwater film and is a CMAS diving instructor, as well as airplane and helicopter pilot, and an experienced skipper. Pippo began his career as a photographer in the Sixties with the most famous pioneers in the world of underwater exploration. He collaborated with major Italian newspapers and magazines covering underwater subjects and geographical explorations in Saudi Arabia and North Africa. In 1980 on board the sloop “Alyan”, he led a 2 year Italian expedition to the Bermuda Triangle, and documented it in a series of 6 one-hour films for the major Italian TV network RAI UNO. Since then he has directed and produced numerous series and specials in various parts of the world for the major TV magazines and programmes in the field of science and nature, including work for the BBC, National Geographic, France 5 and the European Community. In the late eighties he started presenting a successful weekly feature on nature and the environment, that aired for 7 years on RAI UNO. In recent years he has been filming in many parts of the world: North Europe, Africa, Philippines, in the Caraibic Sea and in the Red Sea, and in the Mediterranean, on board the sloop “Esplora”, focusing on different aspects of this sea. He is presently involved in various underwater research projects filming in deep and mixed gas diving.